This shirt was the result of a rookie e-commerce merchant making a mistake. I didn’t realize that the colors on the computer with the backlit monitor would look very different when seen in person—and that maybe, just maybe, the digital previews of the products might not be 100% true to the end delivery. As I’ve mentioned in a prior post, my daughter Alexandra and I have opened a store called Storied Gifts Shop where we feature wearable wisdom and daily inspirations. We are on a mission to think more positively, embrace a sense of well-being and share our journey and products to inspire others who want to be in a healthy state of mind, too. The phrase “the goal is progress, not perfection” spoke to me not because I strive for perfection but because I believe in the power of progress, even when it is small or incremental. I can’t fathom perfection, but I do like and hope to be moving forward. As much as I advocate progress, I’m also a believer in trying. In fact, I think trying is something I do perfectly. Several examples from my past come to mind. There was the time in high school when I asked three consecutive boys to go to a dance, and each one declined. Painful yes, but I learned that I could survive rejection. There was the time I tried for Vice President of my high school class junior year. Again, it was a bust, but I had the courage to stand in front of a full auditorium and deliver a speech. Fast forward to adulthood, and I have a bunch of failures to my credit as well as some successes. Of course, the things that belly up leave a mark but as a tryer, I’ve been fairly good about brushing myself off and trying for the next thing. At this juncture with the Storied Gifts Shop, the goal is to try and learn from mistakes and keep right on trying again. It’s going to be an exercise in focus and merchant growth with the hope of building a community of others who are seeking progress, too. Trying to understand the mindset of a perfectionist, I can relate to some of the issues Elizabeth Lombardo Ph.D. over at Psychology Today describes in her post, “9 Signs That You Might Be A Perfectionist.” Procrastination most definitely comes up, and I’ve been known to think in terms of things I “should” do. And yes, I can go to extremes on occasion, like when I eat three cookies and blow the diet, why not eat the whole container? But I figure there is an overlap of personality quirks we all share and that our “types” are fluid. I still make the case I’m no perfectionist. Reading through Lombardo’s article on those who are, the idea that some people don’t finish projects because they can’t achieve satisfaction with the outcome sounds particularly rough. I found Henrick Edburg’s post “Perfectionism: 6 Powerful Habits,” over at The Positivity Blog to be useful. He says it’s important to get in the practice of telling yourself that if you’ve tried your best for the moment, that is enough. Accept your present best and let a project go. My favorite was Edburg’s tip to only compare your work to your personal measure. By taking the view of your efforts with the goal of each time reaching for your best, you can take pleasure and gratification in a job well done by the most important standard. This eggplant-colored shirt is a lesson in how to set up products in the Storied Gifts Shop with color—both shirt and font—in mind. After I got this shirt, I went through and made certain that all of the shop shirts don’t include the dark colors for now. We will come back to popular shirts and offer white lettering for darker colors in the future. Yes. It is all about the baby steps, which makes me think of the movie “What About Bob?” starring Bill Murray and Richard Dreyfuss. It was a great joke throughout the movie when Bob takes baby steps to get out into the bigger world, but I do believe in them. So, we are taking baby steps in building our shop and building a community of others, because we want to inspire each other toward more positive thinking. 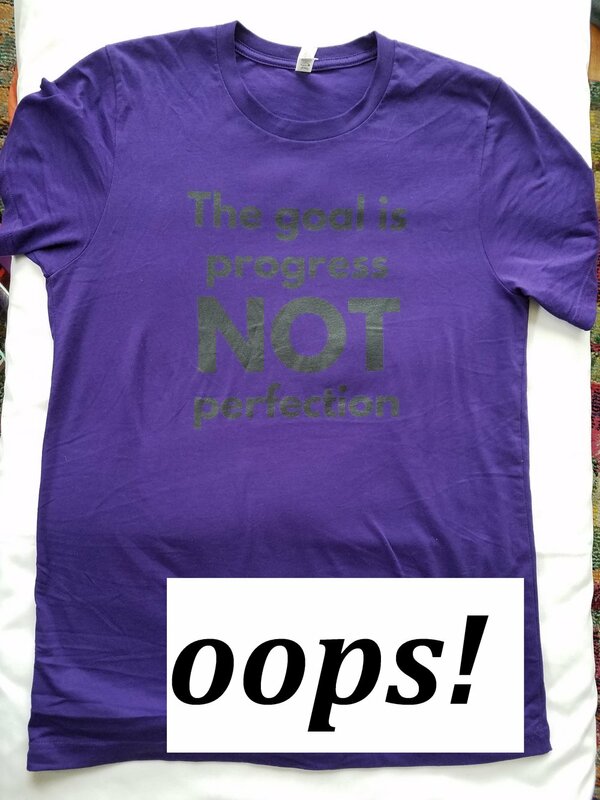 In the meantime, both Alexandra and I have a version of this soft cotton t-shirt in eggplant which is a very pretty color. I will wear it and most likely sleep in it because it is super comfortable. Heck, I might even wear it in public just to see if it sparks a conversation. Most likely it will just remind me that progress is the goal and repeating that often is comfort enough.